Since you’re on the lookout for gift ideas for lawyers, attorneys, or law students, you have probably been lectured well and long on the difference. But for the sake of the uninitiated, let’s make sure we spell out the difference between these three categories of legal experts. First, of course, a law student is someone who is in law school. This person is not yet a lawyer or attorney, but rather in training to become one or both. Second, we have lawyers. These special creatures are those who have successfully completed and graduated from law school. They may provide legal advice, but cannot represent a client in a court of law. Third, and finally, we come to attorneys. An attorney is a lawyer who has not only graduated from law school but has also passed the state bar exam to be licensed to practice law. 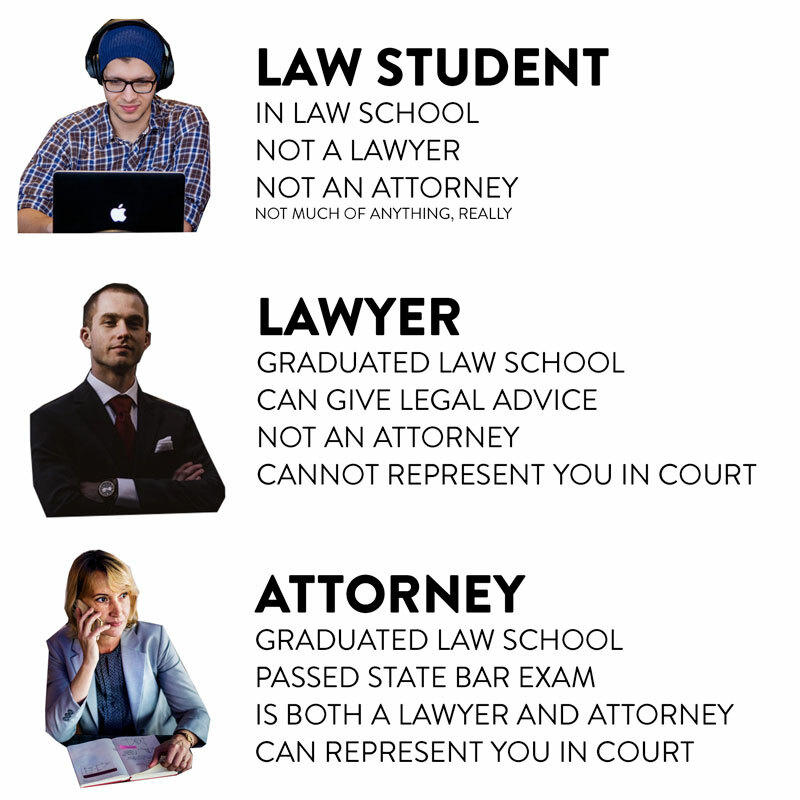 So an attorney is a lawyer, but a lawyer is not an attorney unless they have passed the bar exam. And a law student is in training to become a lawyer upon graduation. Ok, so now the difference is clear. This can be important when you are shopping for a gift, because you don’t want to give a lawyer something that refers to attorneys, or a law student something that describes them as a lawyer (unless it is a law school graduation gift). 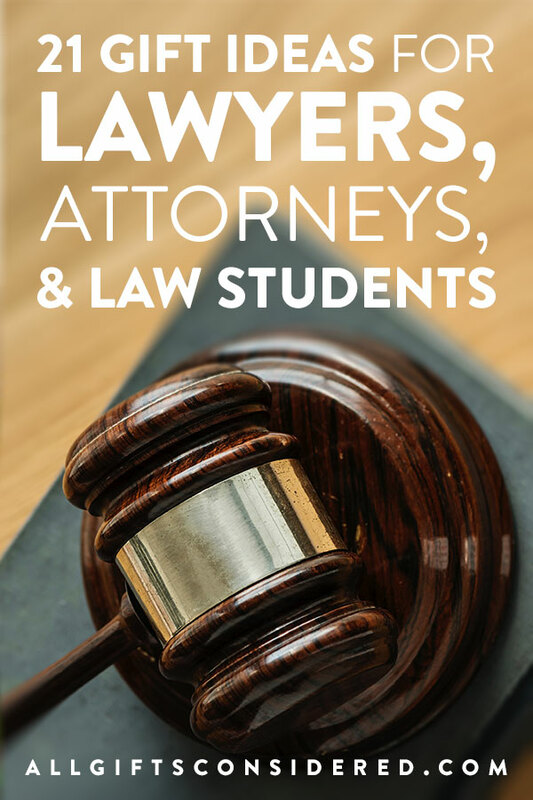 With this in mind, we’ve scoured the internet to gather the very best, most useful, unique, interesting, personalized, funny, and honorable gifts for those who are students of the law. Here are 21 great gift ideas for lawyers, attorneys, and law students. Please note that this post contains affiliate links, including products from Northwest Gifts, our parent site. 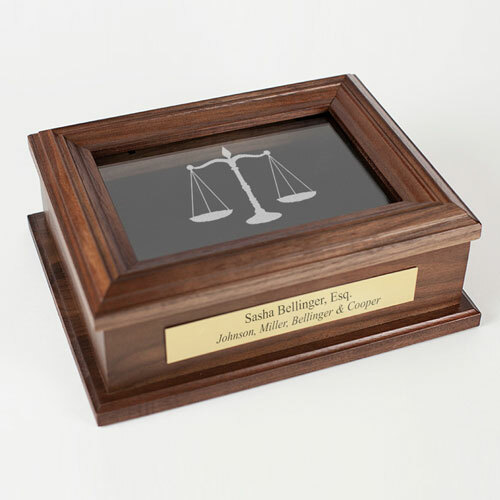 Handcrafted from solid wood at our shop in Oregon and personalized with custom laser etching, this is the perfect gift idea for any law professional. 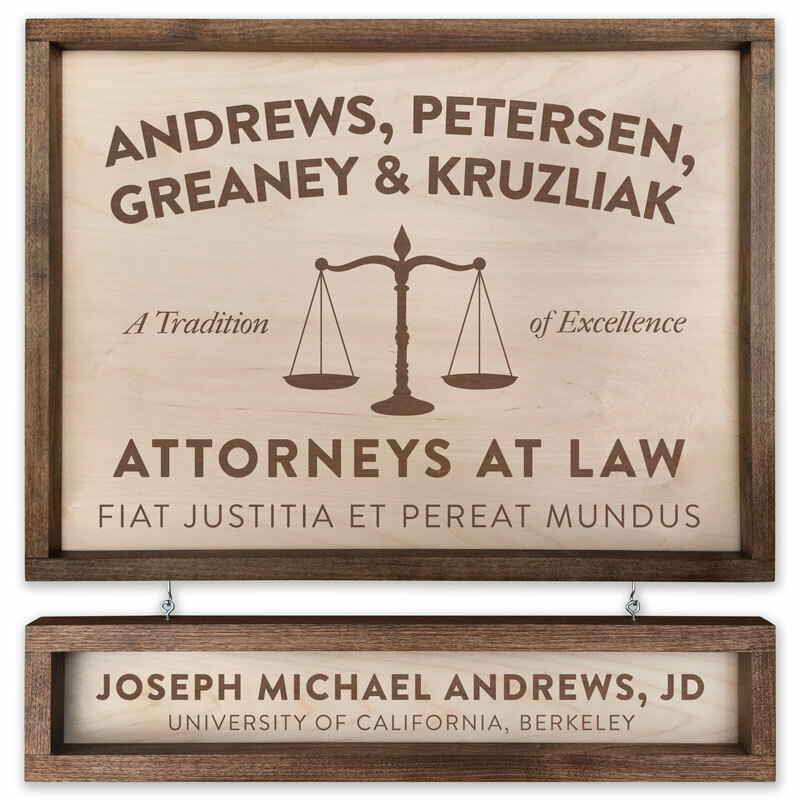 Because the wooden plaque can be completely customized, you can just as easily tailor this gift for the legendary circuit court judge at her retirement as you can for the bright-eyed law student at his graduation. Several sizes available, with or without the hanging name board. You can also get multiple name boards to list each partner in the firm – it’s up to you! 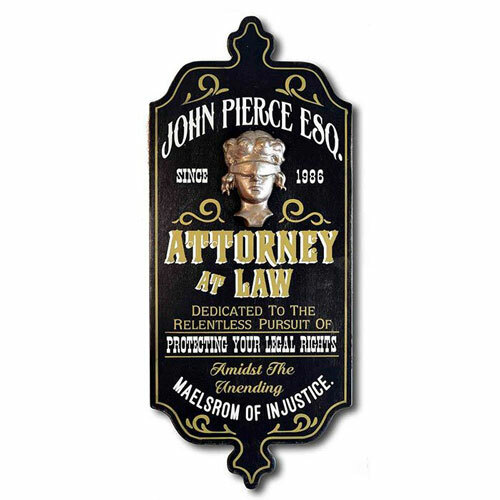 Vintage style meets contemporary personalization with this classy Attorney Plaque. Crafted in the USA from solid wood planks and hand-distressed for the perfect finish, you can personalize the hanging name plank just how you like. Blindfolded Lady Justice takes center stage in a hand-carved golden 3-dimensional applique made in-house by skilled artisans. Lawyers, of all people, can’t afford to lose important items. For the one who appreciates a fail-safe backup system, or for the one who is constantly losing keys or wallet, this is the perfect tech solution. 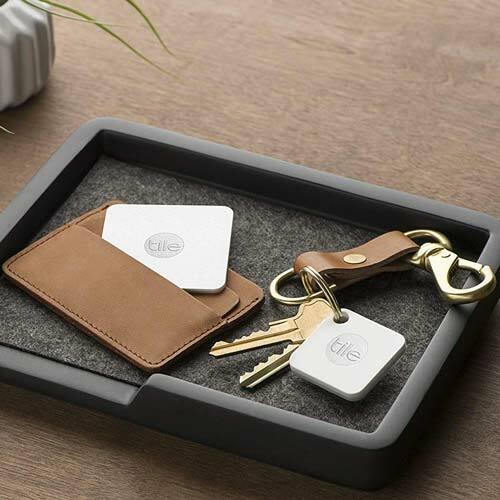 The Time Mate system allows you to attach each “tile” to keys, slip in your wallet, slide into a document pouch or briefcase, and always know where to find it. A must-have for “absent minded professor” types. Stitched by hand in small batches by the artisans at Floto, this premium briefcase is a beautiful and thoughtful gift idea. 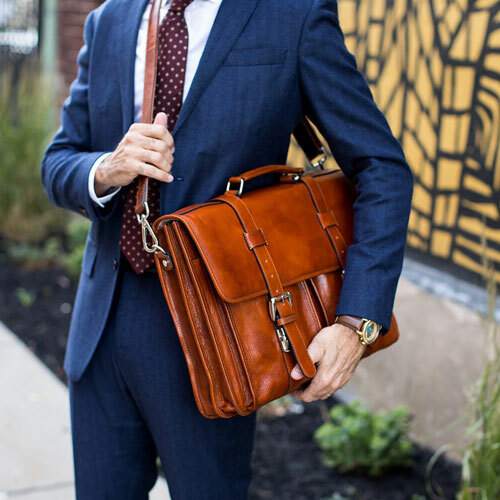 Another popular item is the original Saddleback leather briefcase, available in several natural leather colors. Law school is a rite of passage. Part of the “student” phase involves being willing to do just about anything for food. 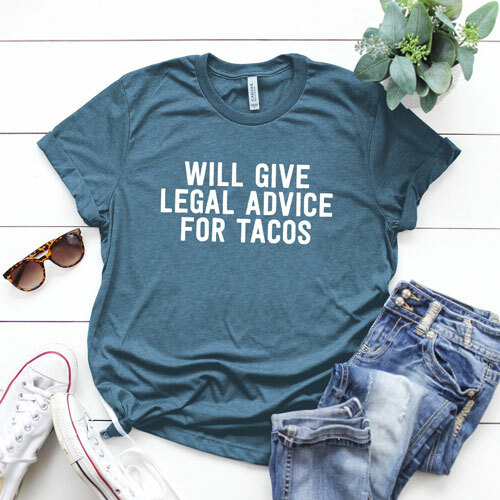 So give your law student a free billboard: Will give legal advice for tacos. Because, you know, it’s true. Anything for tacos. A beautiful and personalized retirement gift for an attorney or lawyer, this walnut wood keepsake box is made in the USA and custom engraved to order. The glass can be etched as is with the “scales of justice,” or with your law firm’s logo, or left blank so that the contents inside can be all the more clearly seen. 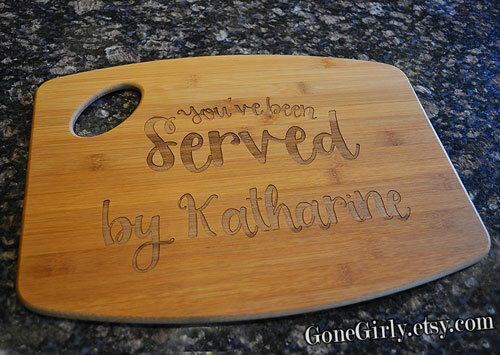 “You’ve been served!” For the amazing person who is part aspiring chef while full-time lawyer, this is the perfect attorney pun and gift idea. The bamboo wood serving tray and cutting board combination includes custom laser engraving of their name along with the classic legal quote. A fun and affordable gift! Also comes as a glass pasta dish. Disorderly Conduct is a fun game that will test the limits of your legal knowledge! Ignorance of the law will no longer be tolerated, and the whole family will soon be up to par and able to go toe-to-toe with the smugly overconfident attorney in your life. This decorative glass sign includes a wooden frame and custom laser engraving. Blindfolded lady justice supplies an appropriate background that highlights the attorney’s name, occupation, and year established. A lovely and elegant gift for a lawyer, attorney, or law school graduate. Oak wood with a rich, traditional stain creates a timeless timepiece your attorney will be proud to display on the office wall. 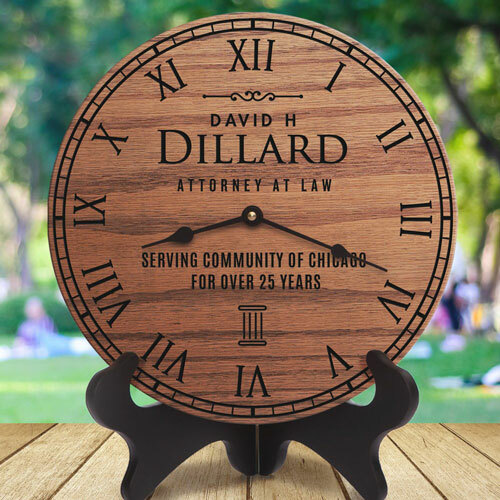 Handcrafted in the USA from genuine solid wood and laser engraved to order, this clock is a beautiful lawyer gift for any occasion. Lawyers are always expected to look their best. Now the always-stylish legal professional in your life can look great even while sleeping. 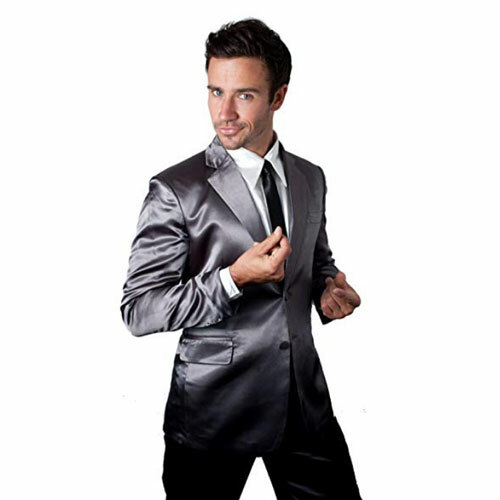 Silk men’s pajamas fashioned to look like a lawyer’s suit and tie make a great “fun” gift. 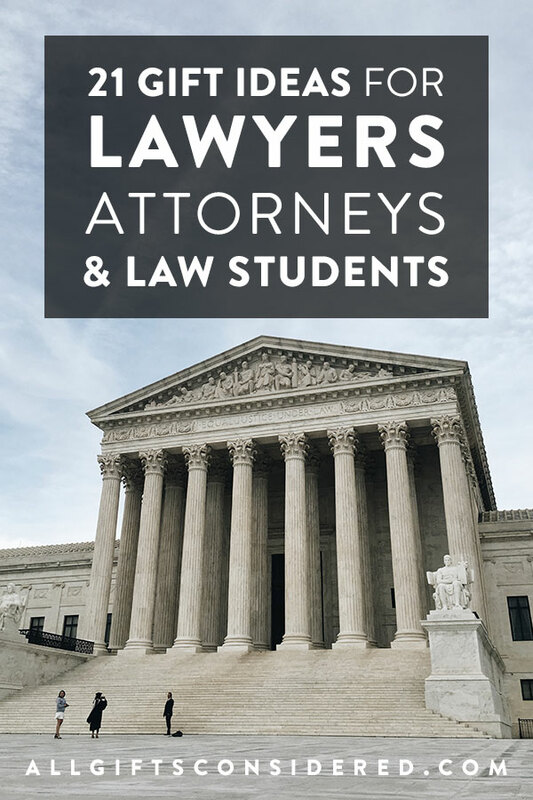 Ideal for law school graduates, paralegals, and interns. Here is a gift idea that doesn’t scream “LAWYER! !” but still exudes class and elan. Perfect for the whiskey connoisseur, this authentic oak wood aging barrel allows the legal professional to flavor their own spirits. 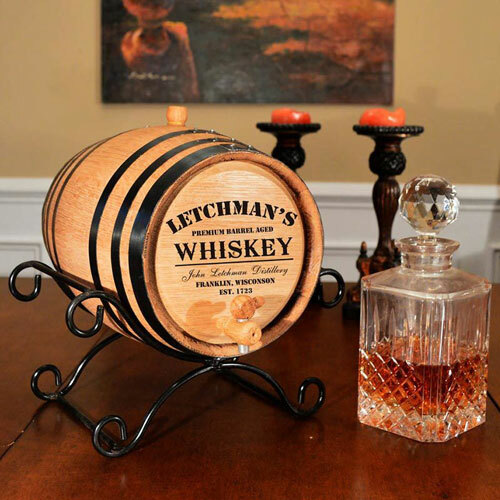 Not just for whiskey, either; our collection of custom laser engraved oak barrels come in a range of themes, styles, sizes, and designs for bourbon, rum, wine, and more. They’ve heard all the lawyer jokes. Now it’s time to fight back. This book has hundreds of witty retorts to leave the would-be jokesters speechless. A valuable addition to any attorney’s library. This is a creative antique-style art deco piece for the attorney’s home or office. 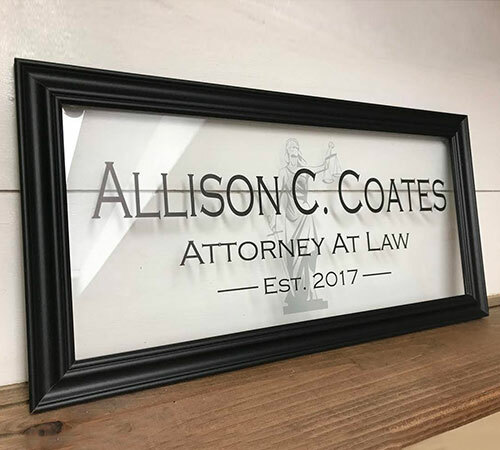 The Old Fashioned Attorney at Law Personalized Wall Art Sign showcases American-made craftsmanship and quality, and includes personalization with your name and year. Plus, at 28″ tall, it’s a pretty good size! Who cares what it actually smells like, the name and description alone make this a worthy gift for the divorce attorney in your life. Nothing captures the rich parchment of a legal document declaring an end to your failed marriage like our candle, Freshly Signed Divorce Papers. It’s not like everyone around you didn’t see this coming, and with the light from this candle now you can see it too. Part happy, part sad, a little relieved, and unsure of your future financial stability: the complex emotions of divorce are captured in this very complex candle. 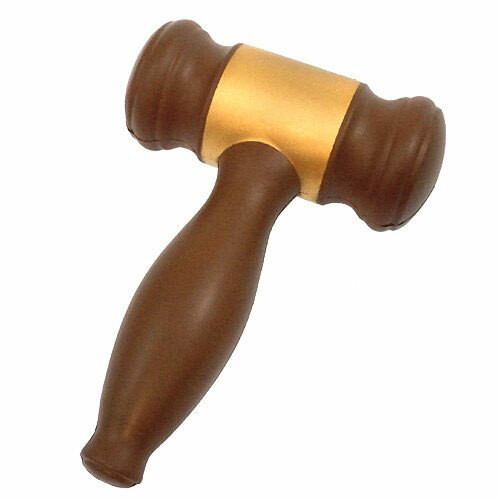 It’s a gavel. It’s a squishy. No more stress. And it’s only like ten bucks. A definite must-have for the stressed out lawyer, attorney, or law student. Every professional needs to find time to stay in shape. When you know that the attorney in your life faces so many demands on their time, why not combine work and exercise so that they can do both at once? 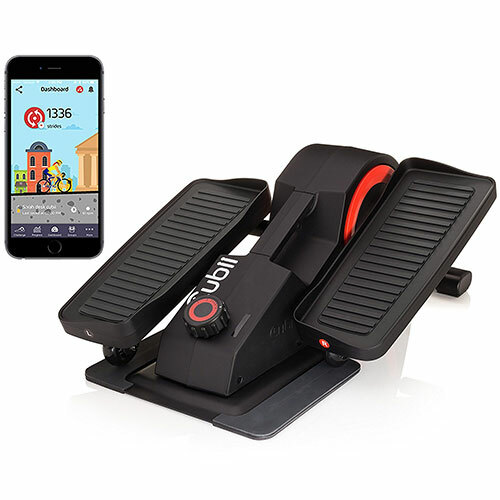 Enter the Cubii Pro, an under desk elliptical designed so that you can work out without your knees ever bumping the underside of your desk. It comes with all the modern bells and whistles: Bluetooth enabled, syncs with FitBit and Apple Healthkit, and is whisper-quiet. A great investment for the continual desk jockey! 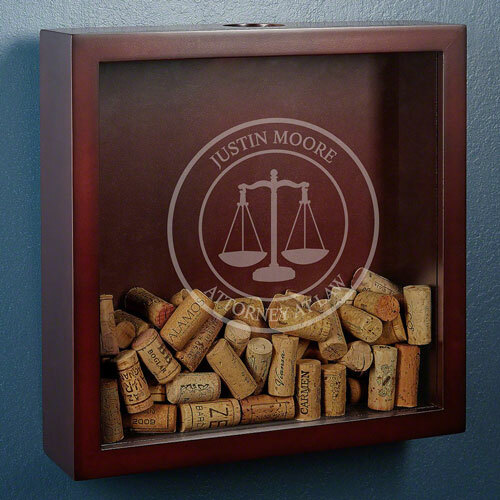 Collect those many, many (and well-deserved) wine corks in style with a personalized shadowbox. This wall-mounted cork catcher is crafted from wood with a mahogany finish and includes laser etching on the front glass window. 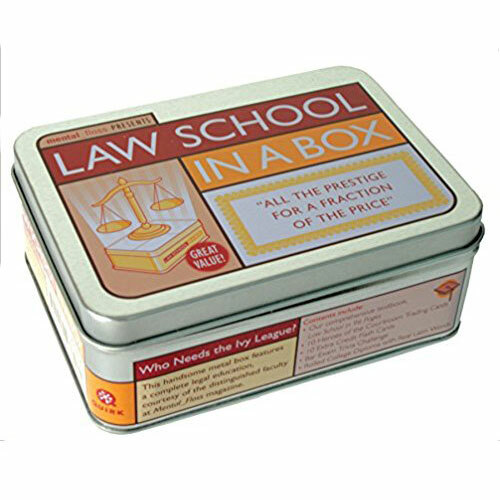 Review for your big tests, for your bar exam, or just for fun with your very own Law School in a Box. 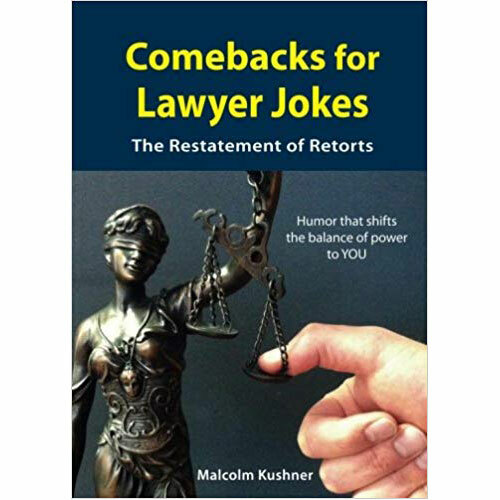 A witty, tongue-in-cheek crash course for lawyers and wannabes that is actually pretty helpful, chock full of information including flash cards, trivia, and quizzes. 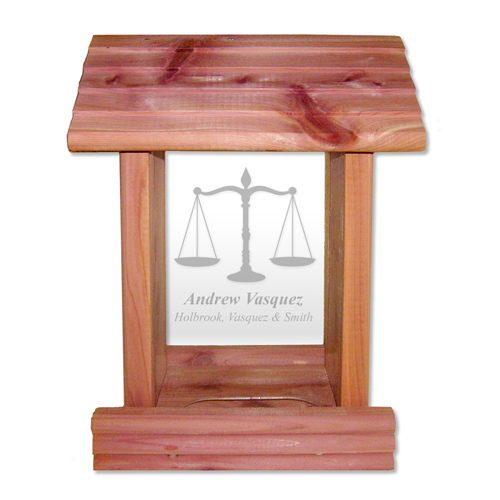 Celebrate a graduation, honor a retiree, or commemorate the passing of the bar exam with this creative and Personalized Lawyer Bird Feeder, made in the USA from real cedar and custom laser engraved. This will draw birds and wildlife to your firm if you hang it outside your office. Also makes a great gift idea for assistants, paralegals, and secretaries. So maybe you’re required to wear a suit just like everyone else, but that doesn’t mean you have to be like everyone else. 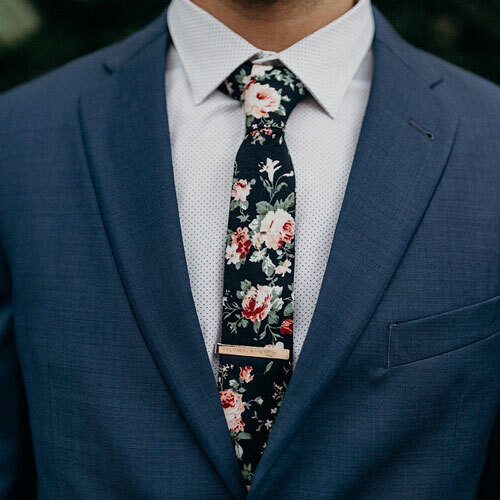 Show off a little pizzaz with your choice of ties, like these eye-catching floral patterns from My Tie Shop. Frederick Thomas is another fun shop that handcrafts creative ties but tones it down **just** a notch. Linen, cotton, tweed, and more, available here. 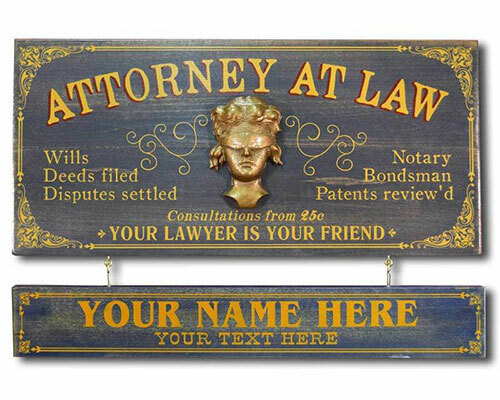 Need more lawyer and attorney gift ideas? At Northwest Gifts, we have hundreds of unique and high-quality personalized gifts. Start with our collection of Lawyer & Attorney Gift Ideas and explore our many fascinating collections. To highlight just one spectacularly different idea, have you considered getting the lawyer in your life a Decorative Fire Extinguisher for the home or office? You should!